Designing a garden involves more than simply picking a spot, turning over the soil and sticking plants in the ground. To create the perfect addition to your existing landscape, you need to consider many things before lifting that first shovel full of dirt. To plan a garden, you need to make decisions regarding location, soil quality and types of plants. Consider your garden bed an investment of both your time and money. Creating the best design for the space will protect your investment and enhance your home's exterior décor. Draw the existing landscape features on the graph paper to scale if possible. Include your home, driveway, walkways, patio, porch, deck and any other permanent features. To determine scale, measure the length of your home. Take this measurement and scale your drawing with one block on the paper equal to 1 foot. Consider the location of your garden bed. Exposure to sunlight and choosing the proper plants for the location can make or break the success of your garden. Watch the sunlight in the planned garden for a few days to determine whether the spot experiences full-shade, dappled shade, partial shade/sun or full sun. Choose an area where your garden will be visible from your home, entryway or outdoor living spaces to increase enjoyment in the beauty of your garden and your hard effort. Consider the shape of your garden. Formal gardens have straight lines and fixed geometric shapes. Less formal gardens are freely shaped with curved lines that enhance the design of your home. For example, a border garden with an irregular edge creates more visual interest than a straight edged border. Both are beautiful, but the curved border creates an illusion of flow that corresponds well with other features in the landscape. Decide on appropriate design aspects. Garden design can get complicated when considering color scheme, balance, symmetry, cohesion and unity of design. Choose a color scheme for the new garden bed that complements the other gardens in your yard or if it's the only garden, one that flatters the home façade. Symmetry refers to the equal proportion of plants on each side of a garden. Balance paired with symmetry allows for more flexibility in the placement of plants. Balance involves the use of color as well as actual kinds of plants to create an overall sense of organization. Cohesion ties the entire design together, including using the use same types of plants from other parts of your landscape to create similarity. Evaluate your location to determine the appropriate plant height. Some homes have sloppy foundations that simply beg for a garden to hide behind. Consider the features near your garden. Don't hide the windows, porch railings or design of your patio. Gardens should blend into the landscape, enhancing the permanent features of your property rather than detracting from them. Decide on plant arrangement. In general, taller plants should be placed toward the rear of the garden or in the center of circular gardens. 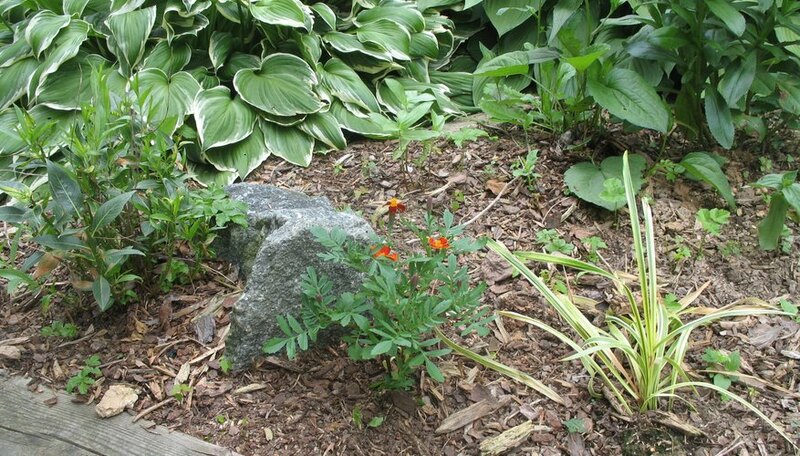 Plants should then range down in size with lower plants such as ground covers and small annuals near the front. This placement allows the plants to complement each other. Decide on your plants by using the Hardiness Zone Map (http://www.garden.org/zipzone/index.php) and resources from your local garden center. No one knows local plants better than the nearest nursery. Consult with a specialist before making final decisions on your plants. Jot down the name, blooming time, sun and water requirements, growing guidelines and soil needs for each plant. Add your proposed plants onto your scaled drawing. Remember that plants need space to grow, especially perennials. You can place fewer plants the first year of planting and add more in the future after the first round becomes established. Also include any planned borders such as bricks, rocks or simple trench edging.